50-Ton Hydraulic rail bender with battery powered pump. Worker can stand 15 feet away while bending rail. For making complete mine turnouts and high volume rail-curving work. 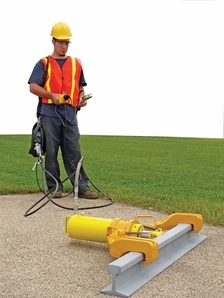 Battery-powered portable pump takes the physical effort out of rail bending. 0-10,000 psi pressure gauge lets worker make uniform repeat bends in the rail. Fixed speed pump and push button control enables operator to control bending process. Spring action return feature pulls piston fully back into cylinder. Ram return also makes air-bleeding easier. Pump is vented, ram can remain in horizontal position. Push-button ram control "Ram Out" or Ram In"
Assembly includes: Bender Frame for 60-85# rail. 50-ton Ram. Electric Pump (24 volt battery powered). Battery Charger (110 v AC). Easy-Read Pressure Gauge. Hose Splitter. Hose (pump to ram). Hose (pump to gauge). Push Button Station (ram in / ram out). Back Pack Carrying Bag 30% down payment required with your order.